If you have not been living under a rock, Hurricane Michael ripped up Florida last week. Not to dismiss the devastation caused in Panama City and Mexico Beach, Panama City Beach was hit pretty good as well. Power out. Water out. Cell service out. 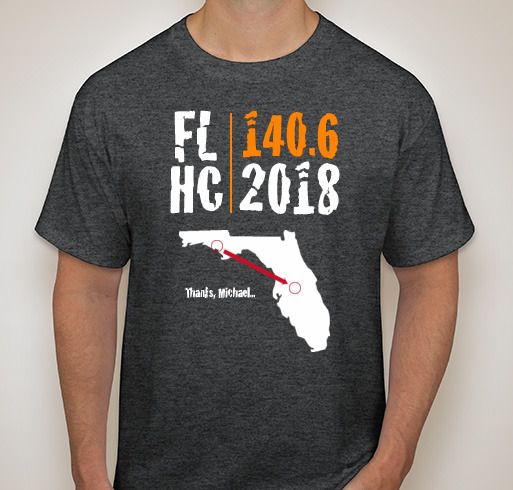 2500+ Triathletes didn’t know what was going to happen to the race on 11/3 in PCB, including yours truly. Amazingly IRONMAN moved the event back a day and 400 miles from Panama City Beach to Haines City. Pulled a rabbit out of the hat. I’m going to skip all the drama that ensued about deferrals, changing trips, etc, and focus on the course. 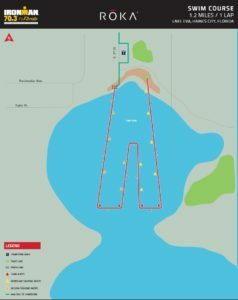 It’s the IRONMAN 70.3 race venue at Lake Eva. Here’s the quick and dirty, so you can trash any course analysis from PCB for this year! Contributions were dug up from the IMFL Facebook group and Diana Woolf who finished up IRONMAN Louisville in full FF gear raising funds for PTSD – check her out! Also, if you want to help out the Red Cross, I whipped up a fun t-shirt that all proceeds to directly to Red Cross. Check it out! 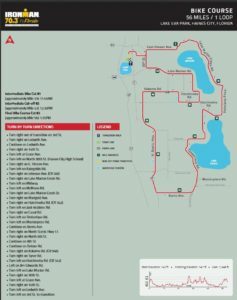 The Bike will most likely be a two loop of what the 70.3 course is so you can reference the Florida 70.3 website for that bike course map. There are some sketchy sections of pavement, but overall most 70.3 racers found it to be fine. Drive it before the race, some of the intersections can be dicey. In April, there was little wind and it was humid and hotter than hell. One intersection is a little technical, but nothing crazy. Wind can be a factor. First 25 is flat and open with quite a few turns in the first 10mile-ish. After bok tower there are hills. Course is pretty much flat, with a few hills (basically on the 2nd half, none of these is long). First half of the course is pretty flat and there might be some wind on the second one. Some portions of the course are not closed to traffic so be careful. You will come screaming down a hill into transition. There will be a lot of people on either side of the road, which usually results in someone trying to cross the street when you are barreling downhill at 30+ mph. Be on the lookout. Do realize the elevation gain from PCB to Haines City. It’s not your pancake flat course, so be ready! The run will be a brand new 3 loop course. It might be a little hillier than you were expecting with PCB. 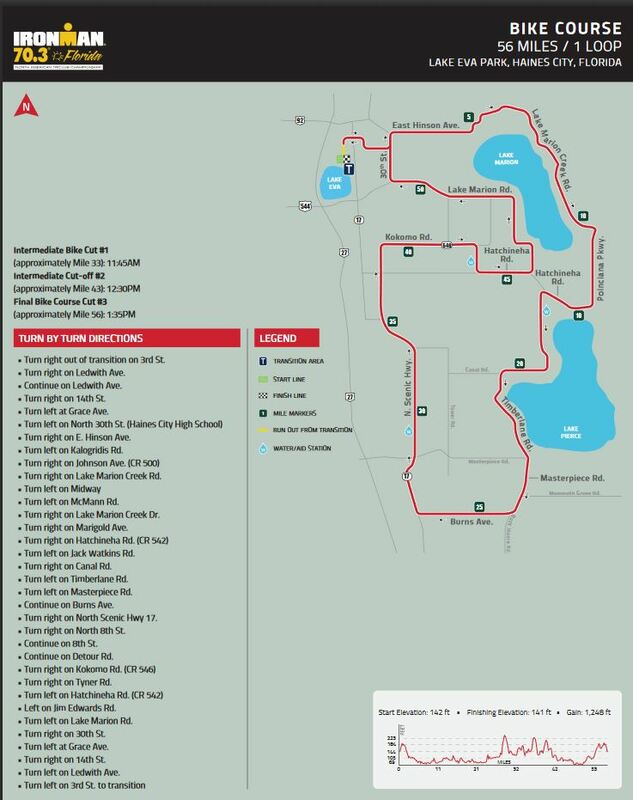 The original 70.3 course was 3 loops for 13.1 miles, you had 2 serious hills with no sun shade. Many false flats. Be ready for a challenge with little cover, heat and humidity.